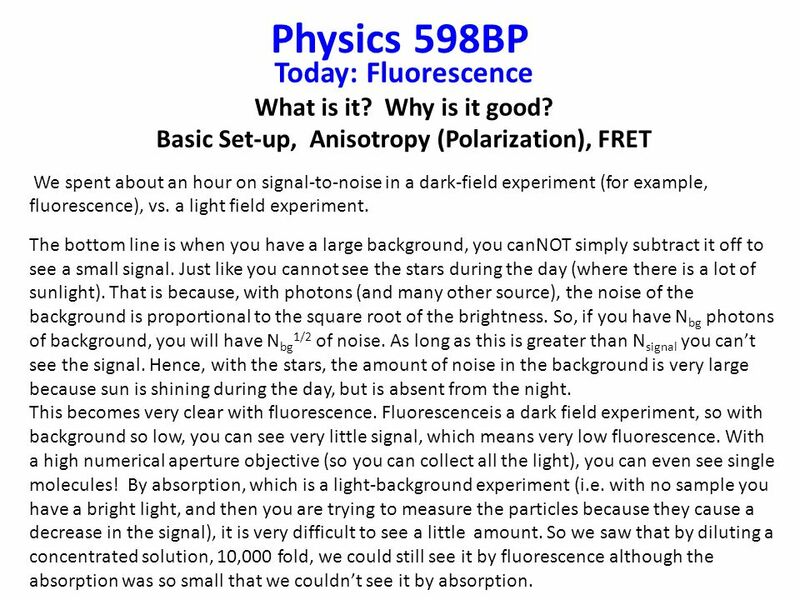 Physics 598BP Today: Fluorescence What is it? Why is it good? 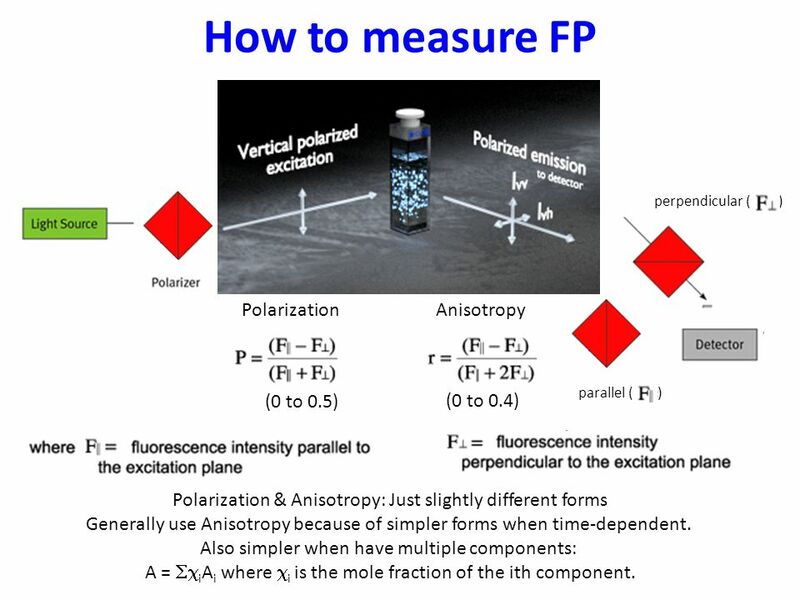 Basic Set-up, Anisotropy (Polarization), FRET We spent about an hour on signal-to-noise in a dark-field experiment (for example, fluorescence), vs. a light field experiment. The bottom line is when you have a large background, you canNOT simply subtract it off to see a small signal. Just like you cannot see the stars during the day (where there is a lot of sunlight). That is because, with photons (and many other source), the noise of the background is proportional to the square root of the brightness. So, if you have Nbg photons of background, you will have Nbg1/2 of noise. As long as this is greater than Nsignal you can’t see the signal. Hence, with the stars, the amount of noise in the background is very large because sun is shining during the day, but is absent from the night. This becomes very clear with fluorescence. Fluorescenceis a dark field experiment, so with background so low, you can see very little signal, which means very low fluorescence. With a high numerical aperture objective (so you can collect all the light), you can even see single molecules! 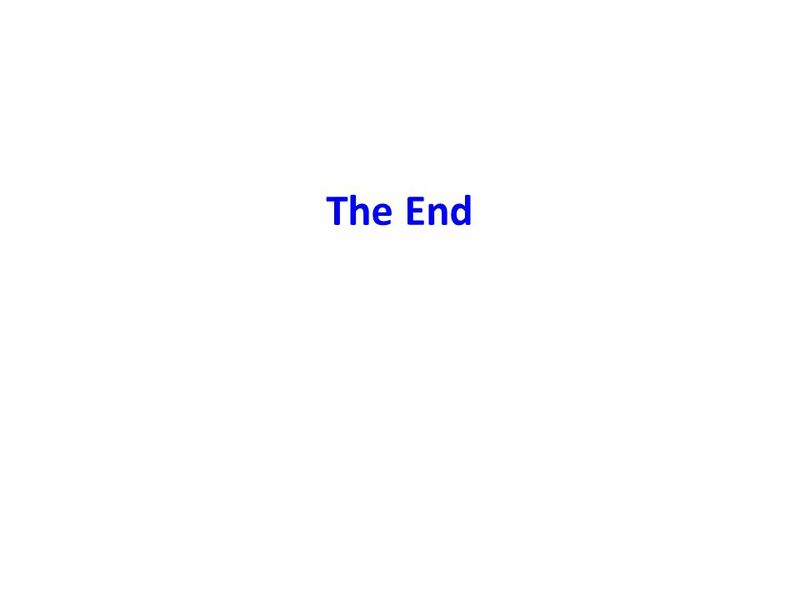 By absorption, which is a light-background experiment (i.e. with no sample you have a bright light, and then you are trying to measure the particles because they cause a decrease in the signal), it is very difficult to see a little amount. 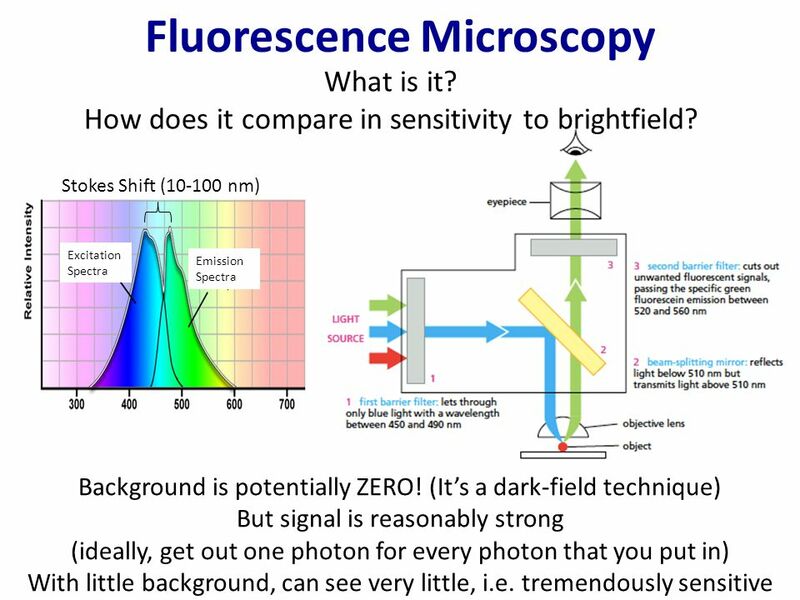 So we saw that by diluting a concentrated solution, 10,000 fold, we could still see it by fluorescence although the absorption was so small that we couldn’t see it by absorption. 4 Photobleaching Important: Dye emits 105 107 photons, then dies! 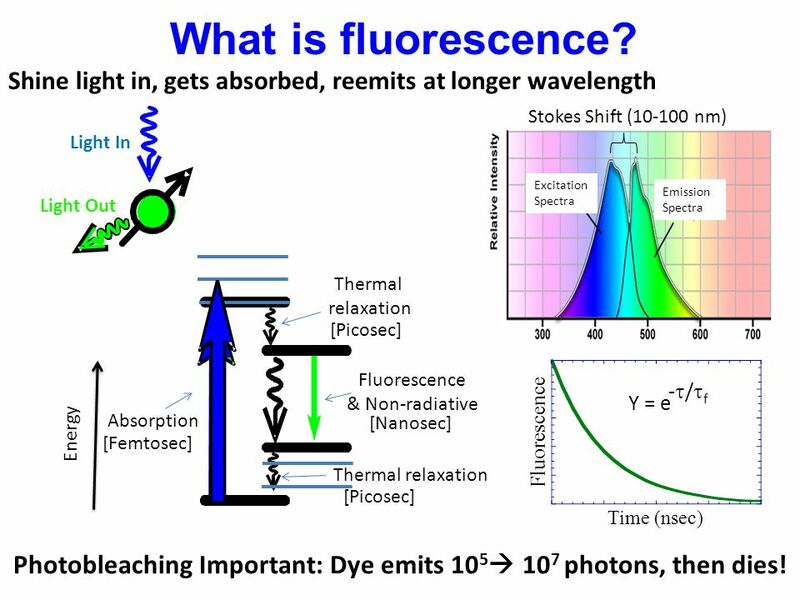 What is fluorescence? 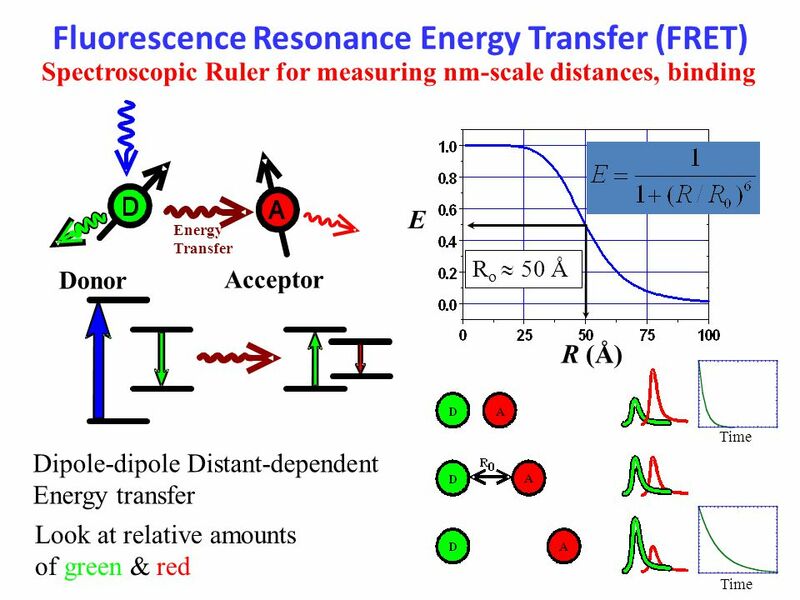 Shine light in, gets absorbed, reemits at longer wavelength Stokes Shift ( nm) Excitation Spectra Emission Light In Light Out Thermal relaxation Fluorescence & Non-radiative Absorption Thermal relaxation [Femtosec] [Picosec] [Nanosec] Energy Time (nsec) Fluorescence -t/tf Y = e Photobleaching Important: Dye emits 105 107 photons, then dies! 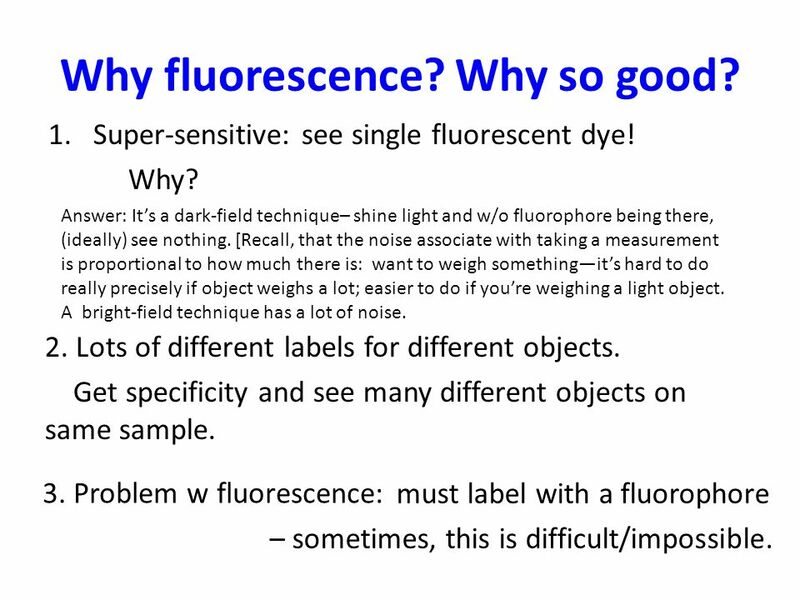 5 Why fluorescence? Why so good? Super-sensitive: see single fluorescent dye! Why? Answer: It’s a dark-field technique– shine light and w/o fluorophore being there, (ideally) see nothing. [Recall, that the noise associate with taking a measurement is proportional to how much there is: want to weigh something—it’s hard to do really precisely if object weighs a lot; easier to do if you’re weighing a light object. A bright-field technique has a lot of noise. 2. Lots of different labels for different objects. Get specificity and see many different objects on same sample. 3. 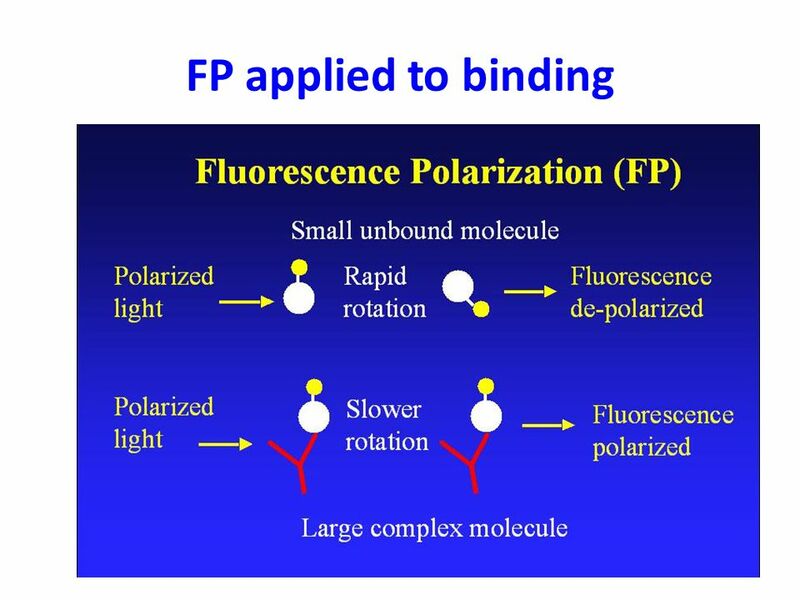 Problem w fluorescence: must label with a fluorophore – sometimes, this is difficult/impossible. 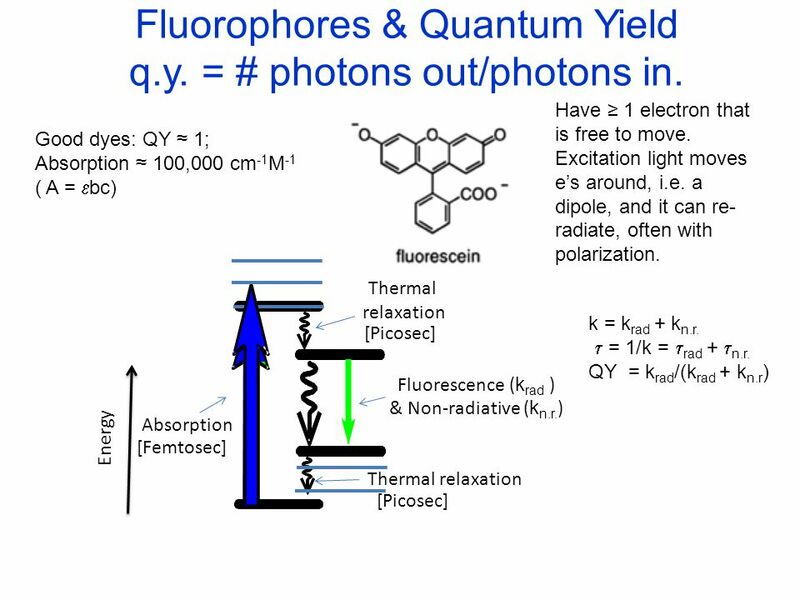 7 Fluorophores & Quantum Yield q.y. = # photons out/photons in. 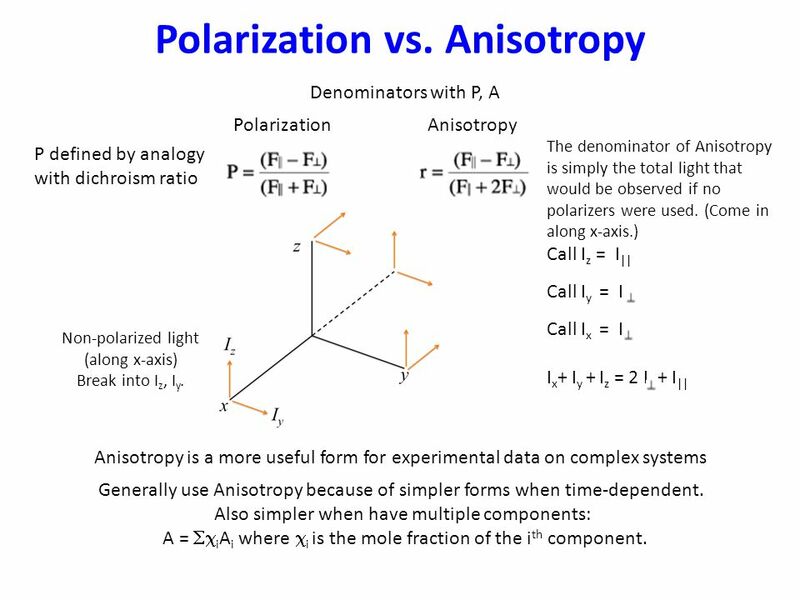 perpendicular ( ) Anisotropy Polarization (0 to 0.5) (0 to 0.4) parallel ( ) Polarization & Anisotropy: Just slightly different forms Generally use Anisotropy because of simpler forms when time-dependent. Also simpler when have multiple components: A = SciAi where ci is the mole fraction of the ith component. 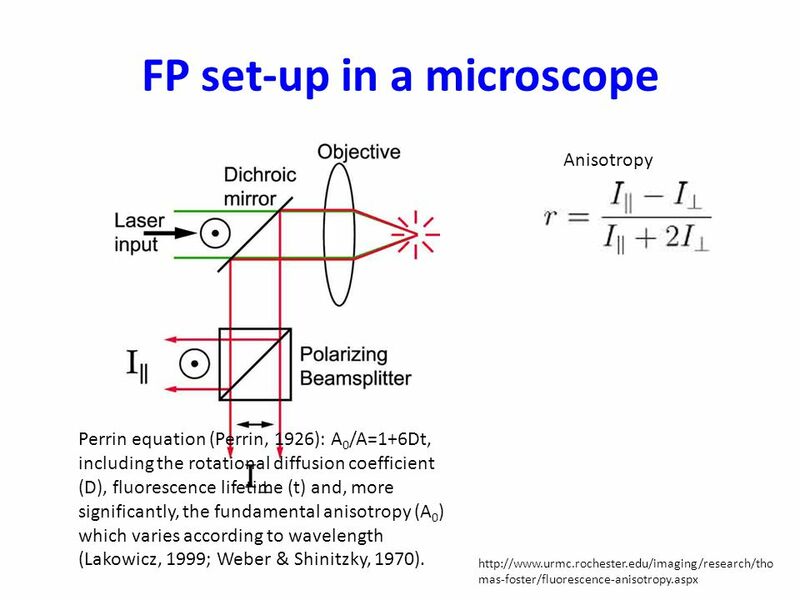 Denominators with P, A Anisotropy Polarization The denominator of Anisotropy is simply the total light that would be observed if no polarizers were used. (Come in along x-axis.) Call Iz = I|| Call Iy = I Call Ix = I Ix+ Iy + Iz = 2 I + I|| P defined by analogy with dichroism ratio Non-polarized light (along x-axis) Break into Iz, Iy. Anisotropy is a more useful form for experimental data on complex systems Generally use Anisotropy because of simpler forms when time-dependent. Also simpler when have multiple components: A = SciAi where ci is the mole fraction of the ith component. 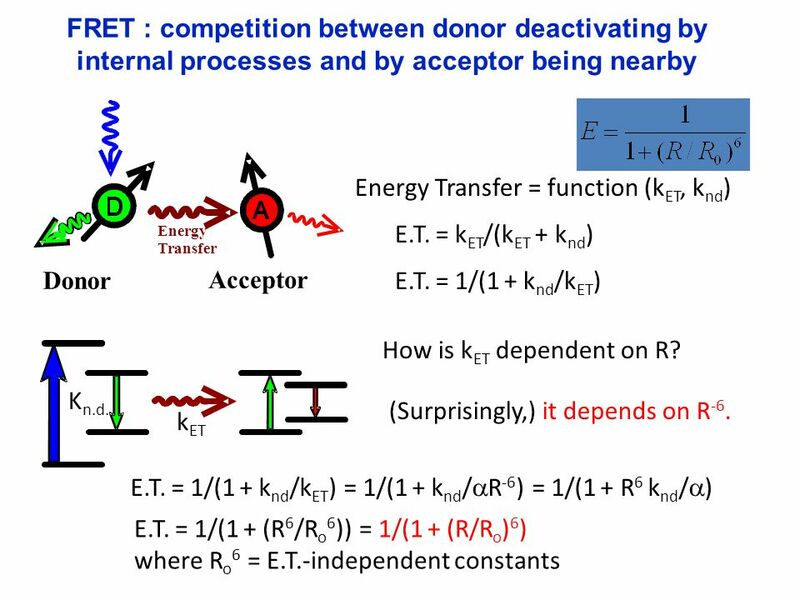 Anisotropy Perrin equation (Perrin, 1926): A0/A=1+6Dt, including the rotational diffusion coefficient (D), fluorescence lifetime (t) and, more significantly, the fundamental anisotropy (A0) which varies according to wavelength (Lakowicz, 1999; Weber & Shinitzky, 1970). 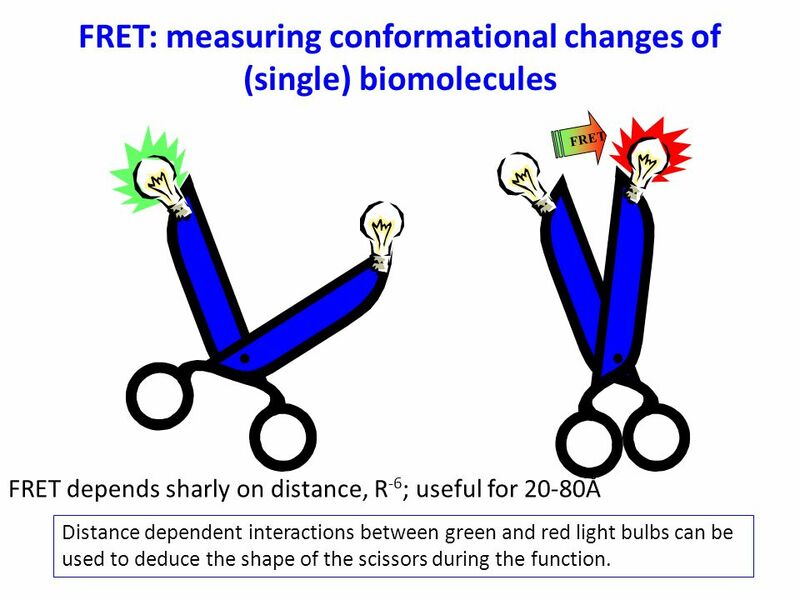 FRET depends sharly on distance, R-6; useful for 20-80Å Distance dependent interactions between green and red light bulbs can be used to deduce the shape of the scissors during the function. 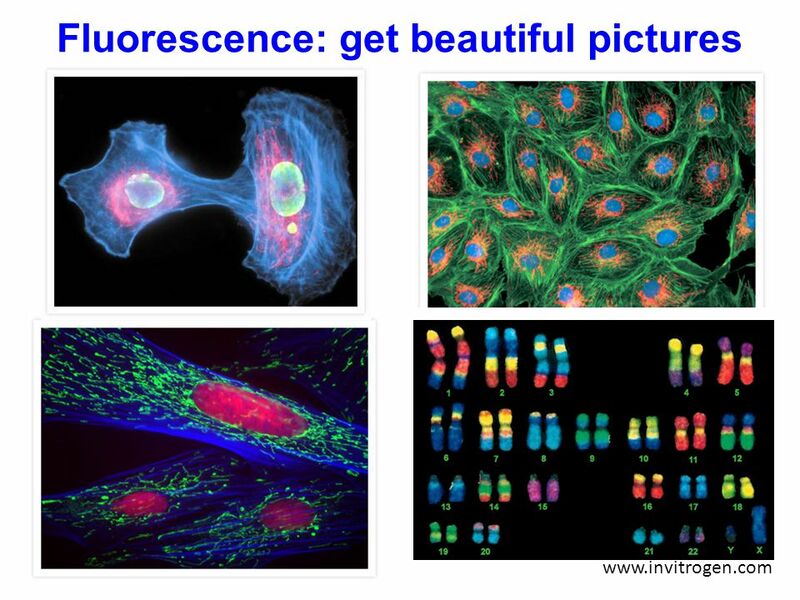 Download ppt "Fluorescence: get beautiful pictures"
Page 1 Klaus Suhling Department of Physics Kings College London Strand London WC2R 2LS UK Fluorescence Lifetime Imaging (FLIM) of molecular rotors maps. 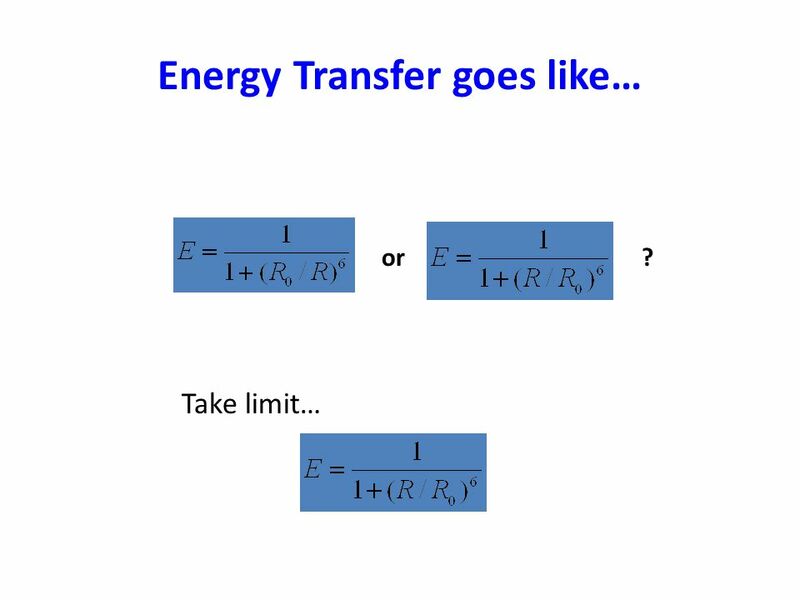 Physics 598 BP: Experimental Biophysics Paul Selvin (Instructor—Lectures) (Usually) Monday 4-5pm, 322 LLP This week only: Tuesday and Thursday, 1-3 (or. Big Question: We can see rafts in Model Membranes (GUVs or Supported Lipid Bilayers, LM), but how to study in cells? Do rafts really exist in cells? Are. Some structures Dansyl chloride 1,5-I-AEDANS Fluorescein isothiocyante ANS Ethidium bromide 5-[2-[(2-iodoacetyl)amino]ethylamino] naphthalene-1-sulfonic. 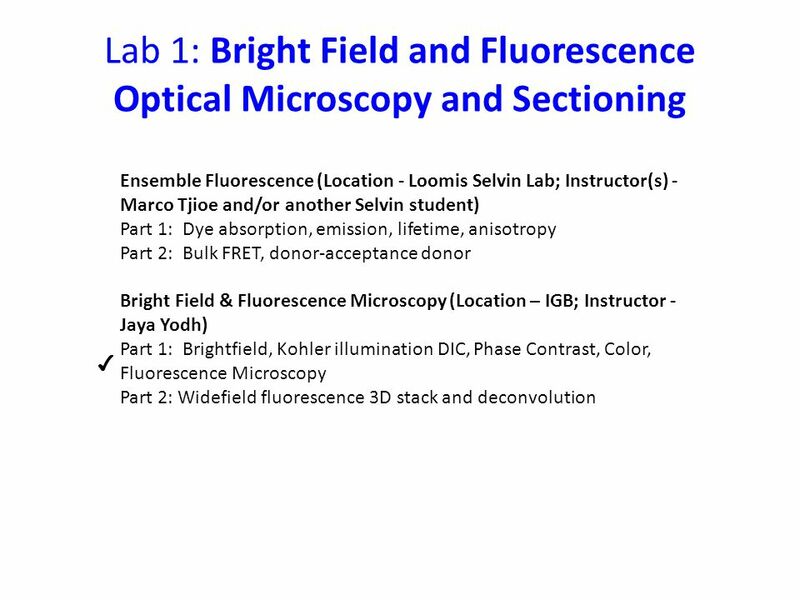 Today’s Topic: Lec 3 Prep for Labs 1 & 2 3-D imaging—how to get a nice 2D Image when your samples are 3D. (Deconvolution, with point scanning or with Wide-field. 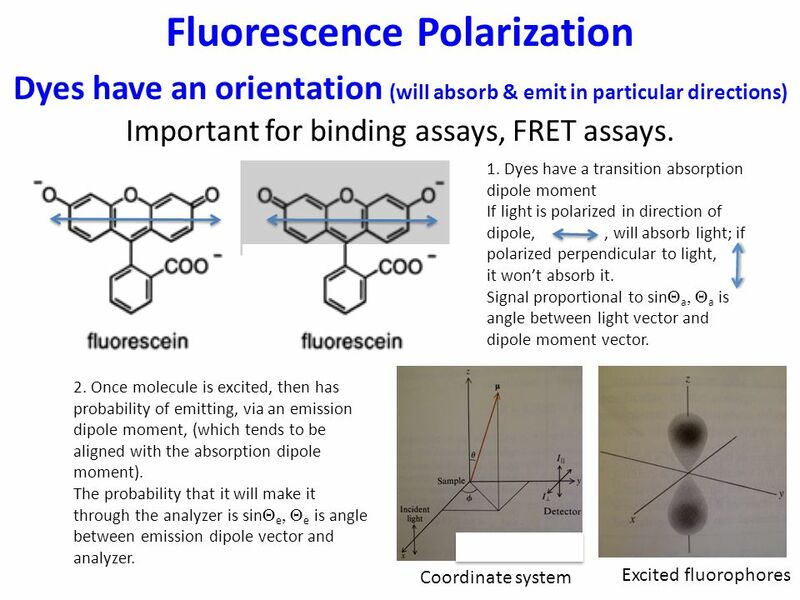 Emission spectroscopy (mainly fluorescence spectroscopy) Reading: van Holde Chapter 11 Presentation: Nicole Levi: “Probing the interaction between two. Special Applications in Fluorescence Spectroscopy Miklós Nyitrai; 2007 March 14. 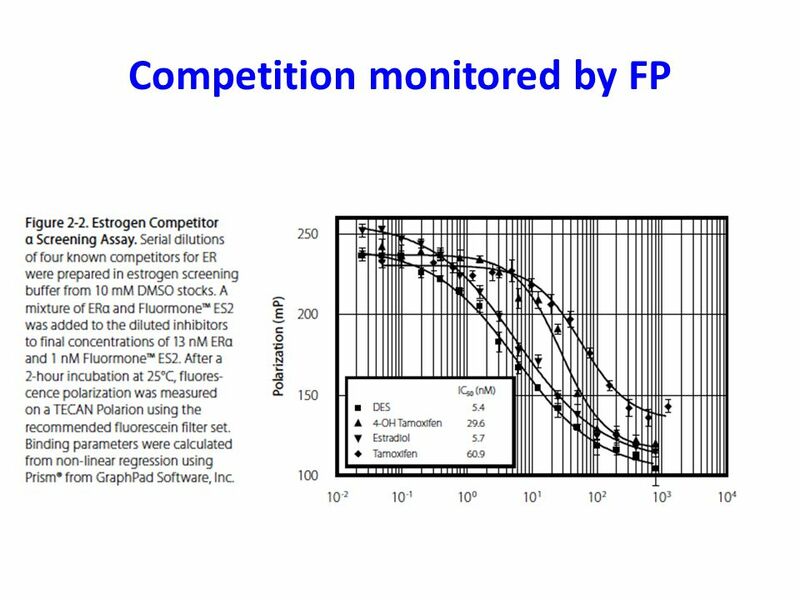 Oligonucleotides – Primers and Probes by … as quality counts! Competence and Service in Molecular Biology metabion´s history. 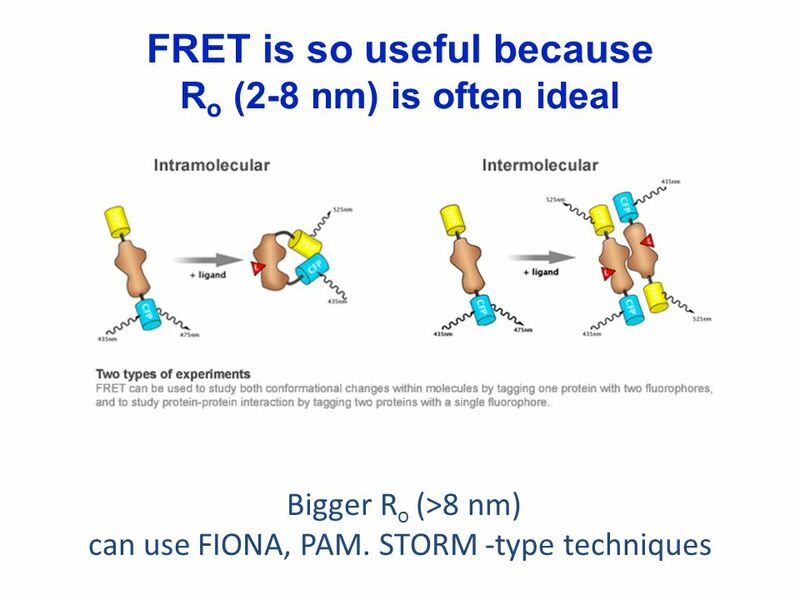 Methods: Fluorescence Biochemistry 4000 Dr. Ute Kothe. Microscopy is about a combination of resolution (seeing smaller and smaller things), and contrast (seeing what you want to see). Both aspects have recently. METO 621 Lesson 5. Natural broadening The line width (full width at half maximum) of the Lorentz profile is the damping parameter, . For an isolated. 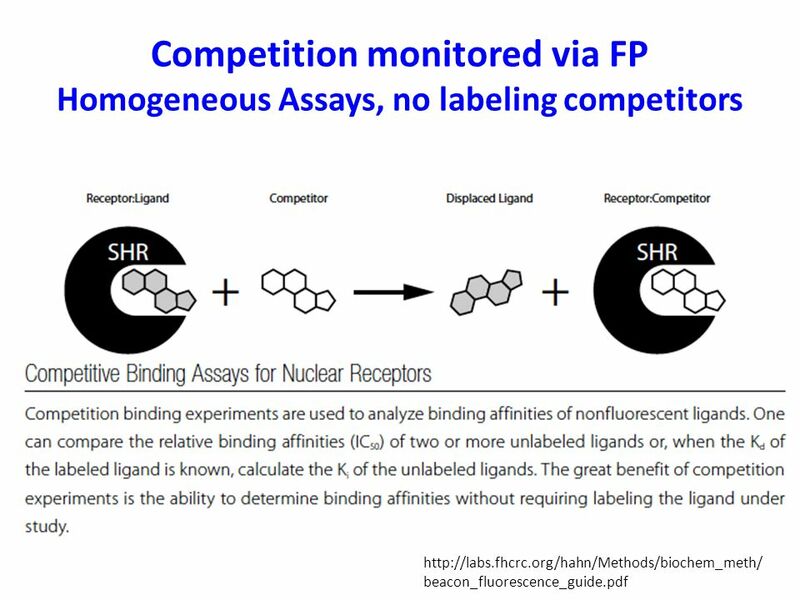 Data Analysis Issues in Time-Resolved Fluorescence Anisotropy Bill Laws Department of Chemistry University of Montana Support from NSF EPSCoR, NIH, and. 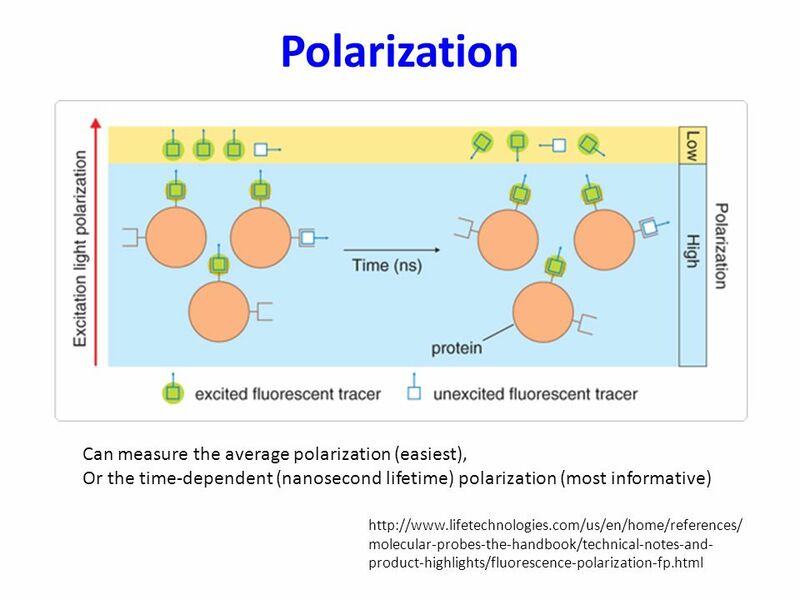 Chapter 15 Molecular Luminescence Spectrometry Three types of Luminescence methods are: (i) molecular fluorescence (ii) phosphorescence (iii) chemiluminescence.